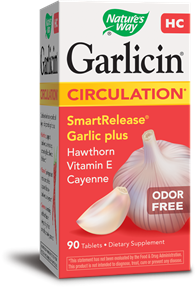 Garlicin® HC Healthy Circulation Formula combines all the effectiveness of high allicin release Garlicin® with the added benefits of Hawthorn extract, Cayenne and Vitamin E.
Garlicin® HC is made from high quality, alliinase-rich garlic powder. Using the SmartRelease® tableting and enteric-coating technology exclusively developed by Nature's Way, Garlicin® HC is guaranteed to have 100% stomach acid protection and rapid disintegration in the intestines. Take 1 tablet two times daily with meals. Do not chew or crush. If pregnant, nursing, or taking prescription drugs, consult your healthcare practitioner before use.